On a sunny September day I was driving top down to a friend’s house when the Google Streetview camera car drove by. 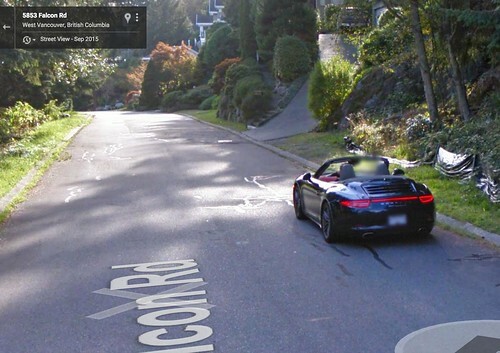 I totally forgot about it until just now when I came home after a short trip to Toronto, and Scott told me that Google Streetview had updated the pictures of West Vancouver. So I did a quick search and found myself right away. Because the Google car has 360 degree cameras you can see me driving towards the Google car, but you can also see the back of my car after the Google car passes me. Google Streetview seems to get updated about every 12-18 months in this area, so until at least early 2017 you can find me at this Google Streetview link (and after that you can still scroll back in time to September 2015).